In today’s world where everything is computerized, we want everything faster and see it as better. I mean, you can order your groceries while driving to work and have them delivered before you get home. Life has become so convenient. We live in our own little fast track world with our own social life online so we don’t see real people around us. However, at Kwa Maritane, we have seen that there are still people out there that, like us, want to make a difference in the lives of those less fortunate. At the end of June, we met Richard Garfinkle, an orthodontist from Portland, Oregon, and his family when they stayed with us. 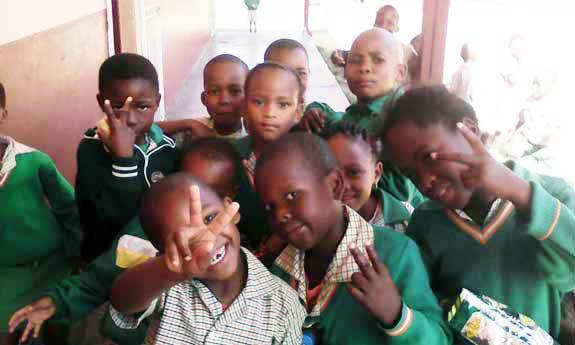 When they packed their bag for their African adventure, they filled their suitcases with supplies for Borite Primary School and used only carry-on backpacks for their personal belongings. That’s right—a massive 55 kilos were packed in the suitcases. What an awesome family to put the needs of others ahead of their own. They collected donations from family and friends as well. They provided clothes, pens, books, toothbrushes, and so much more. So many supplies were collected that the principal of the school was not only able to give things to the neediest of children, but also to the families of the children. You are a special family, and your contribution has already touched so many people. Another contributor we had was Ashleigh van Zyl and her family who reside in Melbourne, Australia. As if the charity work that she already does is not enough, she still took time to help out the students from Borite. During her stay we took a quick trip to the school where she was able to meet the children and see what a difference her contribution would make in their lives. We spoke about the new addition to our Social Responsibility: a hospice near the school. We were thinking of adding this to our PfaP page, as they were in desperate need of help, and I thought no more of it. Later that evening I was asked to meet some of the group at reception. Upon arrival I was told they had conducted a collection and they gave me some money toward the purchase of a bed or equipment for the hospice with the promise that other guests would still be contributing in the morning on departure. 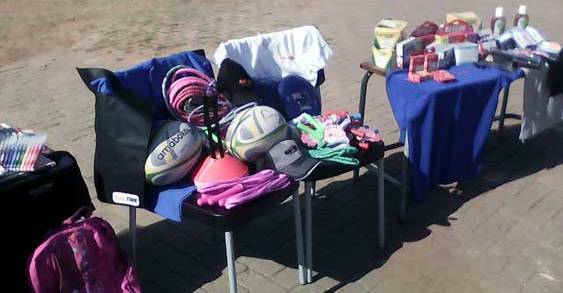 Once again, they did not disappoint: Just over R6000.00 was donated. We are currently talking with the hospice administrator to see how best this money can be spent to provide much-needed equipment. There is still more; in August we received an email from Cathrine Beck, of KALTIRE in Vernon, explaining that she would be attending a conference at the Lodge in September and had seen our page on PfaP. She said she would like to contribute to this, and would discuss it with her work colleagues to see what they could do to assist. This morning I walked in to an incredible mountain of school supplies, puzzles, board games, books, sporting equipment and wall charts. Incredibly this weighed in at an amazing 73.23 kilos. We are all going through to the school Friday to deliver this amazing donation. Over the past 2.5 months, we have been able to pass on an incredible 174.85 kilos of donations to the school. This has prompted us to add the Hospice in Mogwase to our page so we can spread the contributions throughout this impoverished community through various channels. People like Richard, Ashleigh, Margo, Cathrine and the many anonymous contributors are Saints in our eyes. Their passion to improve other people’s lives is a gift that hopefully one day they will be rewarded for. You have reduce us to tears and filled us with hope for a bigger and brighter future, where all men, women and children are considered equal and will walk upright and proud because they are human and belong to a rainbow world. Thank you. Your donations are greatly appreciated, and if you are not aware of it, they are changing people’s lives.